Mayhaw Wildlife Management Area in Miller County produced something this year not seen in the Georgia wilds in more than a decade – reticulated flatwoods salamanders. The first find was Feb. 8. ABAC forest resources lecturer Daniel Sollenberger and three students sampled a pond at the southwest Georgia WMA suggested by student Blaine Tyler, also a Nongame Conservation Section employee. “Maybe we’ll find a flatwoods,” Sollenberger remembers musing. Then on March 24, Jensen, DNR’s Dr. Jessica McGuire and Dr. Chester Figiel Jr. of the U.S. Fish and Wildlife Service dipped up another reticulated flatwoods sally larva at a nearby Mayhaw pond. Sollenberger and students also found three larvae in a separate visit. 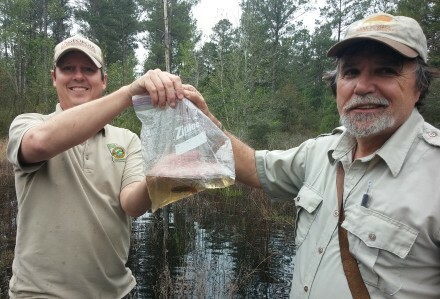 The finds, said Jensen, “give us hope the species will continue to persist in Georgia.” That hope is bolstered because the ponds are on conservation lands, and management at Mayhaw has significantly upgraded habitats, largely through the use of prescribed fire. Federally listed as threatened in 1999, flatwoods salamanders were split into two species, reticulated and frosted, divided geographically along the Flint and Apalachicola rivers – with reticulateds west of the drainage and rated endangered in 2009, and frosteds on the east side and listed as threatened. Though more common in north Florida, reticulated flatwoods sallies were last documented in Georgia in 2001. That record also came from Mayhaw, but from a different site than the recent catches. These amphibians are usually found as larvae in ponds. Adults live mostly underground in uplands, only visiting wetlands to lay eggs. The DNR cam streaming a peregrine falcon nest in Atlanta is online! 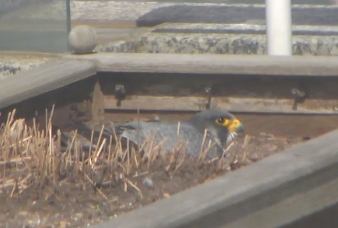 At last count, the peregrines had three eggs. Watch live without ads, or on Ustream (with ads and a chat feature). The eaglets at Berry College are still growing into their feet. But it isn’t for lack of groceries and parental protection. Follow Georgia's best-known bald eagle family on DNR’s website or Berry’s. Help keep the DNR falcon and Go Fish cams streaming! Satellite transmitters the size of a matchbox helped researchers track three North Atlantic right whales the size of semi-trailers this year. One of the whales transmitted from January through mid-March as it swam north from Florida to Massachusetts. 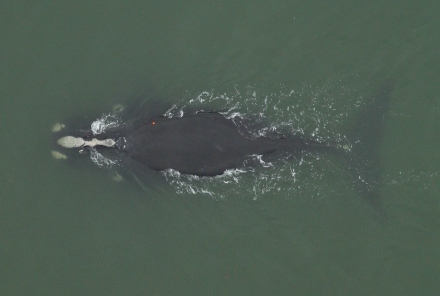 The preliminary results mark a promising start to a three-year project with basically a two-fold focus: Develop a minimally invasive satellite tag to track this endangered species remotely, and better understand how right whales move through the mid-Atlantic. Each year a portion of the right whale population, including pregnant females, migrates more than 1,000 miles from foraging grounds off the U.S. Northeast and Canada to wintering grounds off Georgia and northeastern Florida, the species’ only known calving habitat. Their trip along the mid-Atlantic coast takes them past major ports and through busy shipping lanes. Ship strikes and entanglement in commercial fishing gear are the leading threats to right whales, whose numbers are estimated at 450-500. Proposed seismic surveys and energy development projects may pose challenges in coming years. 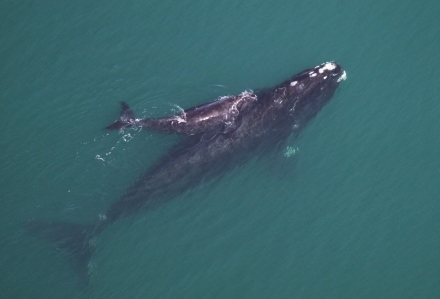 The precise routes right whales take during migration are unknown. The hope is that satellite tags will reveal details that can be used to tailor conservation efforts. Biologists with NOAA Fisheries, Georgia DNR, Sea to Shore Alliance, Alaska SeaLife Center, the University of Alaska Fairbanks and the Florida Fish and Wildlife Conservation Commission began the project this year, tagging three whales off Georgia and Florida in January. One transmitter functioned fewer than 20 hours, another transmitted 14 days and one lasted a surprising 50 days. (The tags -- one shows as the orange dot on the whale's back in the photo above -- attach to the skin and blubber with two small darts and can be easily dislodged.) Whale movements were tracked as far south as Cape Canaveral, Fla., and as far north as Nantucket, Mass. While foul weather and fewer whales than normal sank plans to tag five whales this winter, researchers have high hopes for next year. Two of the whales were well-known animals with identifying numbers in the North Atlantic Right Whale Catalog. The third was a young whale that had not been cataloged. Right whale No. 4092: A more than 6-year-old female tagged off Fernandina Beach, Fla., on Jan. 6. Tracked 14 days to Cape Hatteras, N.C.
No. S078: 1- to 2-year-old “uncatalogued” whale tagged near New Smyrna Beach, Fla., Jan. 20. Transmitted 50 days and more than 1,800 nautical miles from Cape Canaveral, Fla., to Nantucket, Mass. No. 3420: Nicknamed “Platypus,” the 11-year-old female was tagged off Cumberland Island Jan. 21. Transmitted 20 hours. Marks on her skin suggest she “bumped” the tag off on the ocean floor or another whale. Platypus was spotted with a calf off the Florida coast on March 10. In 2009, biologists helped disentangle this whale from fishing rope off the Georgia coast. While the 2014-15 calving season officially ends today, current counts – 17 mom/calf pairs and 13 other whales – weren't expected to change much. The number of calves is up from 10 last year, and closer to the annual average of 19.9 recorded since 2000. Yet fewer juveniles, adult males and non-calving females have made the migration in recent years. The public is encouraged to report sightings of dead, injured or entangled whales at 1-800-2-SAVE-ME (1-800-272-8363) in Georgia or 1-877-WHALE-HELP (877-942-5343) region-wide. You can also identify and help marine mammals in trouble by using these free NOAA apps. One of the things I enjoy most about spring is Mother Nature's annual parade of wildflowers. This showy event actually begins before the official first day of spring and extends well into May. Like the bands, floats and marchers in a traditional parade, each of our wildflowers appears across the Georgia countryside in an ordered sequence. 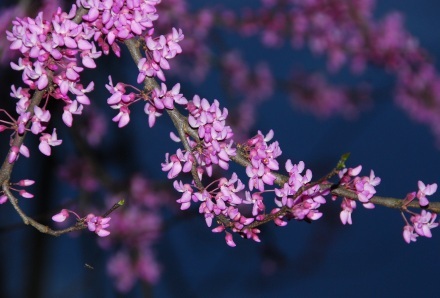 During the past few weeks, one of the first native flowering trees to appear along the parade stretching from Thomasville to Rising Fawn is the eastern redbud. Learn more about redbuds, including planting tips, how wildlife use them and why they’re sometimes called Judas trees, in Terry’s complete column! A quarter-century after Georgia protected alligator snapping turtles from commercial trapping, the heavyweight turtles with lightning-fast jaws are struggling to rebound on the Flint River, a former stronghold for the species. A recent report shows that a catch-and-release survey of alligator snappers on the Flint River last year recorded a catch rate only slightly higher than a similar study in 1989 – .09 turtles per trap night compared to .08 in 1989. Researchers expected numbers that pointed to a stronger population. “Nearly 25 years after the harvest was shut down, they’re still slow to recover,” said Dr. Lora Smith of the Joseph W. Jones Ecological Research Center, which conducted the survey for DNR. The alligator snapper is North America’s biggest and maybe baddest freshwater turtle. Males can weigh more than 200 pounds and sport 30-inch-long shells lined with jagged ridges. Their jaws pack more than 1,000 pounds of pressure. In Georgia, these turtles are found primarily in the Coastal Plain in stream and river systems that drain into the Gulf of Mexico. The Flint anchors that range. The state declared alligator snappers as threatened in 1992. However, demand for the big, easily trapped turtles as soup meat had already decimated populations in southwest Georgia’s Flint drainage. Literally tons were harvested during the 1970s and early ’80s, the hey-day of commercial trapping. The species’ slow growth, maturation and reproduction rates intensified the fallout, and hampered recovery. Rachel King, who did the survey (video) and now works with the Florida Fish and Wildlife Conservation Commission, said illegal trapping and incidental harvest by limb or trot lines and submerged traps could also be contributing factors. 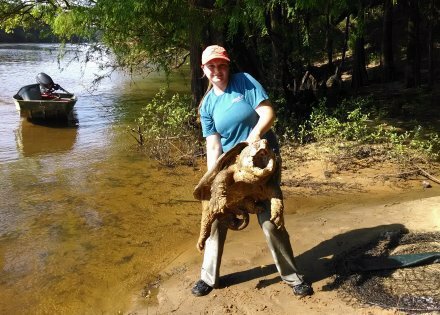 She met people on the river who complained about alligator snapping turtles being protected, saying they were common and good to eat. “I feel there definitely needs to be a little more education about the ecology of this species,” King said. Alligator snappers live-trapped in the mainstem Flint, from Lake Seminole north to Salem in Upson County, May-September. 56 alligator snappers caught and released. Heaviest weighed 90.4 pounds. Catch rate: .09 turtles per night per trap. Compared to 1989 survey: Slightly higher but lower than expected catch rate; more juvenile turtles; increase in average weights. Haven’t filed your taxes? 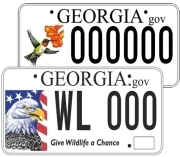 When you do, help conserve Georgia wildlife by contributing through the Wildlife Conservation Fund tax checkoff – line 26 on the long income tax form (Form 500) or line 10 of the 500EZ form. Giving is easy and every donation helps. The checkoff is critical for conserving nongame species, from bog turtles to bald eagles. The DNR Nongame Conservation Section does not receive state appropriations for this work, depending instead on fundraisers, grants and contributions. The checkoff accounted for 10 percent of the support raised during fiscal year 2014. A golden eagle outfitted with a transmitter last month near Thomaston has migrated into Canada, crossing the border Monday (map). DNR is part of a regional project exploring migration routes and habitats used by golden eagles in the eastern U.S. The bird from Georgia (video) is considered part of a rarely seen population that migrates into the Southeast and is not linked to golden eagle releases in northwest Georgia in the 1980s. DNR’s John Jensen recently received the 2015 Alison Haskell Award for Excellence in Herpetofaunal Conservation from Partners in Amphibian and Reptile Conservation. Presented at the North American Wildlife and Natural Resources Conference in Omaha, Neb. (photo), the award honors a person in North America who shows extraordinary commitment to conserving reptiles, amphibians and their habitats. Jensen is a senior wildlife biologist with the Nongame Conservation Section. A caution for campers: Do not bring firewood into Georgia’s state and federal lands where camping is allowed. Firewood can transport destructive, non-native pests such as the emerald ash borer. Learn more at Georgia State Parks and Historic Sites and don’tmovefirewood.org. The Alabama shad spawning run is on, and DNR fisheries staff have been collecting shad on the Apalachicola River below Lake Seminole’s Jim Woodruff Lock and Dam. 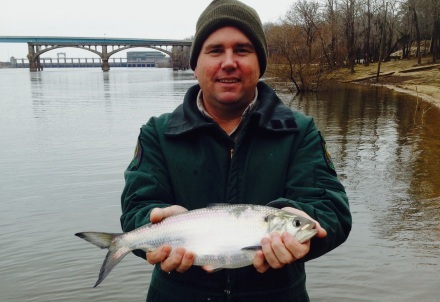 The work is key to managing and restoring Alabama shad, a federal "species of concern," in the Apalachicola-Chattahoochee-Flint basin. More on the project. Video of an indigo snake taken by DNR fire management officer Shan Cammack and posted on the Wildlife Resources Division’s Facebook page attracted more than 1 million views. Cammack later videoed this “beautiful canebrake rattlesnake” seen during a prescribed fire at Sprewell Bluff Wildlife Management Area. White-nose syndrome is taking a bite out of Georgia’s cave-dwelling bat populations. DNR-led surveys this winter marked estimated declines attributed to WNS of 94 percent in Sitton’s Cave (Cloudland Canyon State Park) and 70 percent in Howard’s Waterfall Cave (Southeastern Cave Conservancy) since 2013. Prescribed fire season is in full swing! The Wildlife Resources Division applied fire to priority lands throughout the state last year, burning nearly 58,000 acres to benefit wildlife and habitats. Sites this year have varied from the Brunswick dredge island, critical for nesting seabirds, to the sandhills ecosystems of Ohoopee Dunes Wildlife Management Area near Swainsboro. Shan Cammack discusses prescribed fire with young reporter Wyatt Powers for his "RockeTT Report" video. Coastal Plain bogs in the Claxton area that have long been a conservation focal point added scores of new purple pitcherplants, yellow pitcherplants and rose pogonia orchids thanks to plantings this month coordinated by the Georgia Plant Conservation Alliance. Volunteers and partners such as the Nongame Conservation Section and Atlanta Botanical Garden took part. Atlanta Botanical Garden propagated the plants, pivotal for restoring the rare bogs, from seed collected at the site over the past decade. Camp Adventures in Conservation offers sixth- through eighth-grade students the opportunity to bird, canoe, mist-net bats, explore bogs, study streams and sample other adventures across Georgia! The July 20-24 camp is one of many educational camps held or based at Charlie Elliot Wildlife Center near Mansfield. Women, here’s your chance to visit a barrier island and learn outdoors skills varying from sea kayaking to surf fishing. A Coastal Beyond Becoming an Outdoors Woman Workshop is set for July 24-27 on Sapelo Island. Interested in island birding? DNR State Parks has organized a Sapelo birding weekend May 1-2, with possibilities varying from roseate spoonbills to painted buntings, and even plain chachalacas. 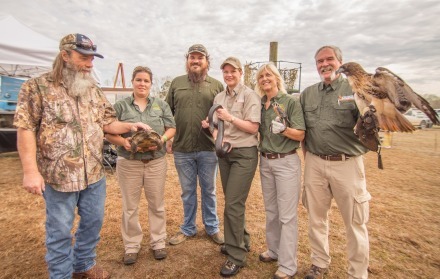 Two former rattlesnake roundups drew crowds, coverage and even, in Claxton’s case, “Duck Dynasty” celebrities this month. Claxton’s Rattlesnake and Wildlife Festival and the Fitzgerald Wild Chicken Festival have both grown since changing to more wildlife education or community-centered formats. Nongame Conservation’s Alan Isler and staff recently finished planting about 100 acres of native groundcover at Chickasawhatchee Wildlife Management Area near Albany. 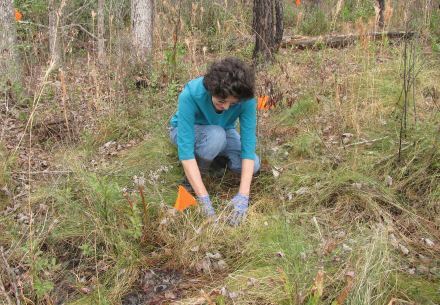 Part of ongoing efforts to restore longleaf pine ecosystems, Isler used a seed mix of legumes, forbs and grasses harvested from Silver Lake WMA. Birder Ethan Hatchett made this video of Henslow’s sparrow surveys led by DNR wildlife biologist Todd Schneider at Townsend Wildlife Management Area near Ludowici. Hatchett will join friends, including some in the Henslow’s video, as part of the Chaotic Kestrels team in DNR's Youth Birding Competition April 25-26. Conflicts between people and wildlife show that living responsibly with wildlife can take work. A National Wildlife Federation blog post offers these tips for homeowners on the urban fringe. A conservation field day for landowners and land managers scheduled for April 16 near Augusta will cover topics such as establishing longleaf pines, controlling invasive species and learning about incentive programs. Sponsored by the National Wild Turkey Federation and Georgia Power, the field day will be held at a Georgia Power recreation area in Burke County. Details. Fall Line Sandhills Wildlife Management Area continues to provide unique wildlife, and unique conservation efforts. 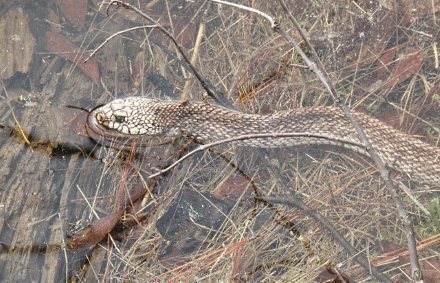 The WMA in Taylor County recently produced a pine snake (above) – a seldom seen species yet one of Georgia’s largest snakes – and two gopher frog egg masses (video), the only ones found in regional ponds this year and needed to help restore the rare frog species at The Nature Conservancy’s Williams Bluffs Preserve ("Eggs mark leap forward," Feb. 28, 2013). Also see Reinhardt College’s Project Pine Snake. Four non-native constrictor snakes that grow big have been declared “injurious” wildlife by the U.S. Fish and Wildlife Service. Listing reticulated pythons and green, DeSchauensee’s and Beni anacondas under the Lacey Act will help restrict the species’ spread in the wild, making it illegal to import them into the U.S. or its territories or transport those already here across state lines. Warm, sunny days sandwiched between cold weather led to a manatee record in Florida’s annual aerial survey. The state Fish and Wildlife Conservation Commission reported a preliminary count of 6,063 manatees, beating the previous high set in 2010 by almost 1,000 animals and bolstering the case that conservation efforts are succeeding. Photos. Names in the news: Cpl. Jason Roberson was named the DNR Law Enforcement Division’s 2014 Boating Office of the Year, in part for his work patrolling and educating boaters at Lake Lanier. Capt. Thomas Barnard is now Maj. Barnard, switching from supervisor of Law Enforcement’s northeast Georgia region to the command staff at Law Enforcement’s headquarters in Social Circle. Bird banding times, dates at Panola Mountain State Park, Stockbridge – April 18, 6 a.m.; April 25, 6 a.m. For updates, including schedule changes, email Charlie Muise, Georgia Important Bird Areas Program. April 10: Deadline for state competition entries in the Give Wildlife a Chance Poster Contest, open to Georgia students K-5th grade. April 14-16: DNR public hearings on proposed 2015-2017 hunting regulations. Schedule. April 16: Conservation field day for landowners, land managers and professionals, Georgia Power recreation area, Ebenezer Road in Burke County. Register by April 10. Sponsored by National Wild Turkey Federation and Georgia Power. Details. May 9: Frogging by Kayak, Fort Yargo State Park, Winder; also June 6, Hard Labor Creek State Park, Rutledge. "Georgia golden eagle added to project tracking Appalachian ‘ghosts’," WABE-FM (Atlanta), and others including Coastal Courier and The (Barnesville) Herald-Gazette. 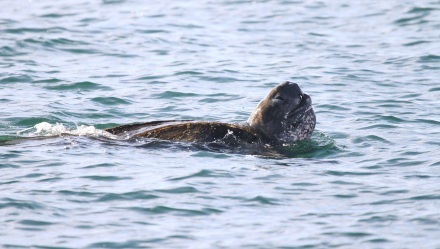 A young leatherback sea turtle takes a deep breath 25 miles off the coast of St. Simons Island last December. Leatherbacks are an endangered species and the world’s largest marine turtle. The heaviest recorded was 2,016 pounds – more than 1 ton! Most leatherbacks found along the Georgia coast weigh from about 850 to 1,000 pounds. They are often observed in association with dense aggregations of jellyfish, their primary prey. While sea turtle nesting season starts soon, loggerheads, not leatherbacks, are Georgia’s main nesting sea turtle. The Georgia Sea Turtle Cooperative documented two leatherback nests in 2014. The juvenile gopher tortoise below was found at Kolomoki Mounds State Park near Blakely this month. Gopher tortoises, our state reptile, are benefitting from controlled burns and longleaf pine restoration at the southwest Georgia park. A DNR gopher tortoise survey crew spotted this tortoise. 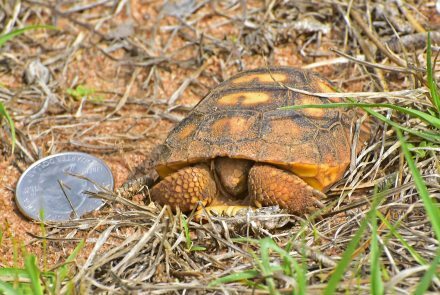 Until their shells harden at about 6 to 7 years old, juvenile tortoises are particularly vulnerable to predation, according to the Gopher Tortoise Council.